Geghard Monastery, Geghardalich (Monastery Lake), Vishapakars, Temple of Garni: Mountain Biking Trail is a 42.3 kilometer moderately trafficked point-to-point trail located near Garni, Kotayk, Armenia that features a lake. 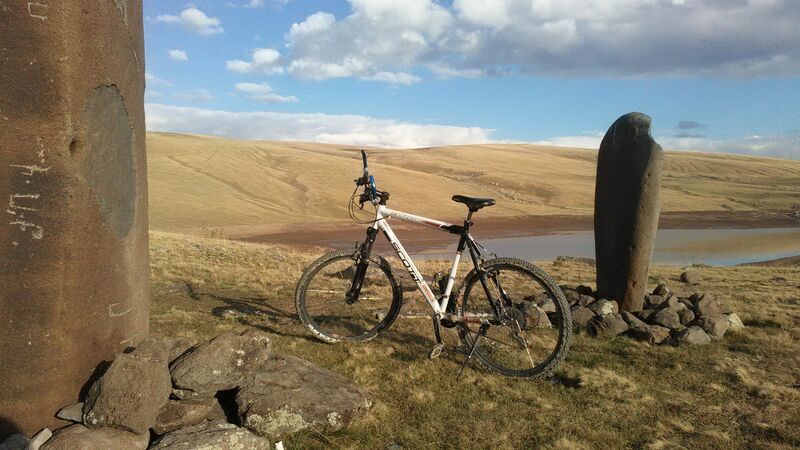 The trail is rated as moderate and is primarily used for nature trips and mountain biking. 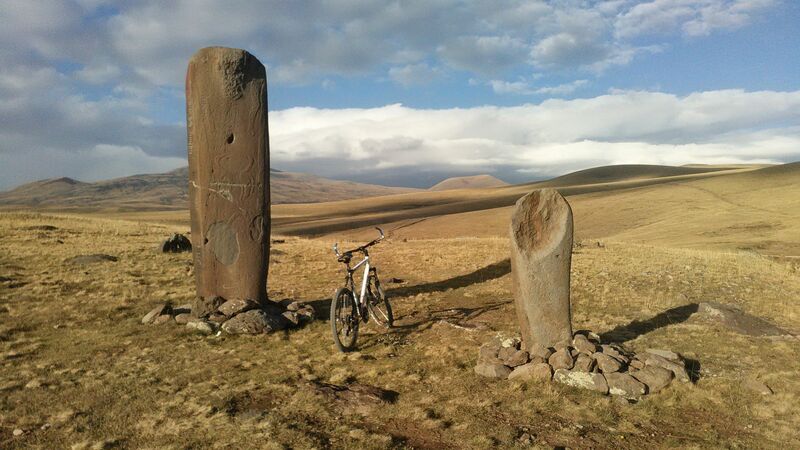 This biking trail starts at the Geghard Monastery, one of the most famous sights in Armenia. The monastery is surrounded on three sides by mountains, giving it a special charm. You can frequently see the inhabitants of Geghard village playing Armenian national music by the entrance of the complex. The trail is paved for the first 5km, but is covered in sandstone (soil) for the rest of the way. A few kilometres away, in the Geghama Mountains, you can see cattle and people living in tents (until the first signs of snow). The silence of the road may be interrupted by birds living in the plains. Soon after, Mount Azhdahak (3,795m), the queen of the Geghama Mountains, will come into sight. Geghardalich is 21km away from the initial point of the trail, where large and small Vishapakars stand ten meters tall. The return path is initially the same, but then the route turns and leads you to the pagan temple of Garni, which is the end of the route. On the way back, you can stop at the observation point and admire the beautiful view of Mount Ararat. On the way back, you can stop at the observation point and admire Mount Ararat. Description of the Monuments Geghard Monastery: Geghard Monastery is one of the ancient monasteries of Armenia, in the historical Geghardadzor region. Situated on the right bank of the Azat River, it includes two-storied stone temples and a church. The Geghard complex consists of cave structures, including a main temple, two vestibules, two churches, and several chambers and tombs. Geghardalich (Monastery Lake): Geghardalich is located in the highlands of the Geghard plateau. It is a small freshwater lake and water reservoir. In many tourist routes, Geghardalich and Vishapakars are considered key sights of the Geghama Mountains. “Embraced” by the highlands, the lake is one of the most beautiful natural monuments of Armenia. The lake is formed from snowmelt and spring floods. The water in the lake begins to subside in September as it is used for irrigation. Vishapakars (III millennium BC): Numerous ancient statues dedicated to the worship of dragons are found in the high plateaus of the Geghama mountains, north of the Geghard Monastery. These statues are known as Vishapakars (dragon stones) and date back to the III millennium BC. Vishapakars were composed of solid stone, the biggest of which is 5.06m tall. They resemble fish, but snakes, bulls, rams, storks and other animals are also depicted on them. Temple of Garni: The Pagan Temple of Garni is situated on the Azat riverbank. Legend has it that Garni was founded by Hayk Nahapet’s (the ancestor of all Armenians) great-grandson, Gegham, who named the temple after his grandson Garnik. Another legend claims that Garni was originally called the Temple of the Sun, dedicated to the Armenian sun god Mihr. Garni’s fortress, taking on a Hellenistic architectural style, was built during the reign of King Tiridates I in the year 76. Despite being destroyed several times, the fortress was always restored by Armenian kings, in the form of a summer residence, a military camp, and even an Episcopal Residence. Flora: The flora of the Geghama Mountains is very rich, colorful and fragrant, in the summertime. There are no forests and trees along the sierra, as it is located 2,800 meters above sea level. The alpine landscape is marked with meadows and small mountain lakes, and the frigid shores of streams and rivulets descending from the mountains are covered with alpine flowers. Here you can see the dark blue alpine violet; there’s also chamomile, immortelle, thyme, nettle, dandelion and bellflower in the lowlands. Fauna: In the illustrations of the Geghama Mountains, you can see various species of wild animals. The petroglyphs of the Geghama mountains portray a diversity of animals including wild bulls and oxen, Caucasian deer, lions, roes, horses, foxes, wolves, dogs, boars, lynx, leopards, hares, swans, and reptiles. Safety: Ucom and VivaCell-MTS networks are almost always available between Fantan village and Mount Gutanasar. In case of emergency, call 911, a service which is available throughout Armenia. Technical Specifications of the Trail The best time to visit – from May till October Yerevan is 36km from Geghard, so you can reach the place in 48 minutes by taxi, which would cost 3,600-4,000 AMD. The distance of the route is 42.6km. The biking trail duration is 5 hours. The area is located 1,760-2,756m above sea level. 85% of the road is covered by sandstone, 15% is paved. Be sure to take bottled water. How to Reach the Biking Trail To reach this trail you should begin at the village of Geghard. It is most convenient to travel by taxi, which is quite affordable throughout Armenia. We recommend taking a cab with a working taximeter, and making sure the driver uses it.